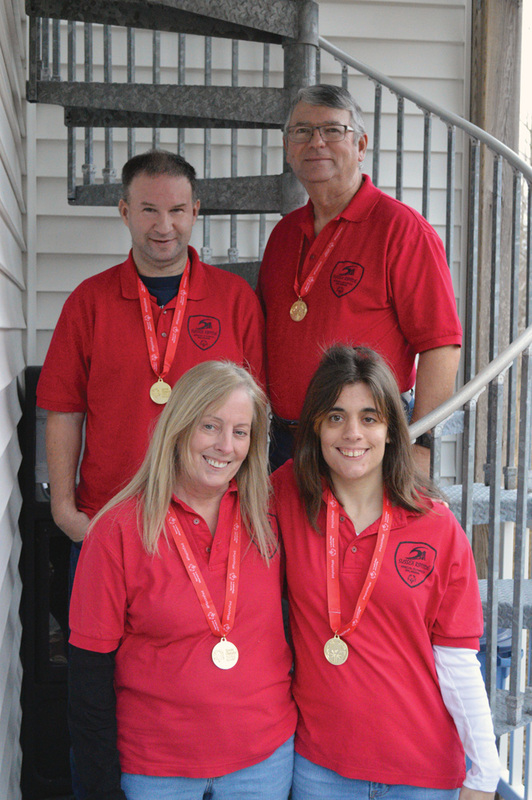 Brian and Bruce Arrendall, and Chris and Jillian Calanna all won gold medals in the Special Olympics bowling tournament on Saturday, Jan. 26, in Dover More than 300 people participated in the Delaware Special Olympics bowling tournament on Saturday, Jan. 26, at the Brunswick Doverama. Local entrants Chris and Jillian Calanna of Ocean View, as well as Bruce and Brian Arendall from Dagsboro, competed as Unified teams during the day of bowling action. The Calannas and Arendalls performed well, and each team came away with gold medals for their efforts as members of the Sussex Riptide. Jillian Calanna is also a member of the Special Olympics tennis program, which competes at Sea Colony in Bethany Beach. She said she loves being involved in the different sports. The Calannas are originally from Staten Island, N.Y., but Jillian Calanna admittedly enjoys being a Delaware resident. When she is not bowling or playing tennis, Jillian Calanna goes to a day program three days a week at the Salvation Army, and is an employee of Marshalls in Rehoboth Beach. Chris Calanna, who is retired, now works part-time with her daughter at Marshalls, as her aide. A special moment during the bowling tournament for Jillian Calanna came when she was bowling against another girl named Jillian. The similarities don’t end there. They have the same middle initial. Like Chris Calanna, the other Jillian’s dad is the sports director for her team — the Kent County team, in that case. The Jillians really hit it off. So much so that they have become phone buddies. The Arendalls have been all over the Special Olympics scene since moving down to the area close to 15 years ago. The duo has been bowling together for nearly 20 years, having formerly resided in Newark. Bruce Arrendall has been along for the ride with his son Brian every step of the way. Outside of sports, Brian Arrendall is employed at the local Easter Seals service center, and he had previously been working at the courthouse in Georgetown. The Riptide team featured close to 70 participants in the state tournament this year. To see the excitement and joy that their kids get to have by being involved in the sports, in and of itself, is a great reward for the pair of parents, they said. Delaware Special Olympics bowling is one of more than 30 Olympics-style individual and team sports that provide meaningful training and competition opportunities for persons with intellectual disabilities. For the state tournament, there were four different divisions, featuring Traditional Singles, Unified Doubles, Singles Ramp and Singles Bumper. According to the Special Olympics website, about 1.4 million people worldwide take part in Unified Sports, breaking down stereotypes about people with intellectual disabilities in a really fun way. ESPN has served as the Global Presenting Sponsor of Special Olympics Unified Sports since 2013, supporting the growth and expansion of the program, which is designed to empower individuals with and without intellectual disabilities to engage through the power of sports. To get involved in Special Olympics, visit the website at www.specialolympics.org, or more specifically for Delaware residents, go to www.sode.org.